Open the bottle of wine. Pour the pomegranate juice filling the glass about a quarter of the way full and add 1/2 of the cranberry cocktail. Decorate with cranberries with sugar and mint. Serve immediately. You can save money and time by using a combination of pomegranate and cranberry juice. Drinks give our family dinners color and texture, especially during the holiday season. Whenever I think of December, I imagine red items, red fruits and red clothes. This is the inspiration for todays cocktail. It takes just a few minutes and needs only 3 ingredients. 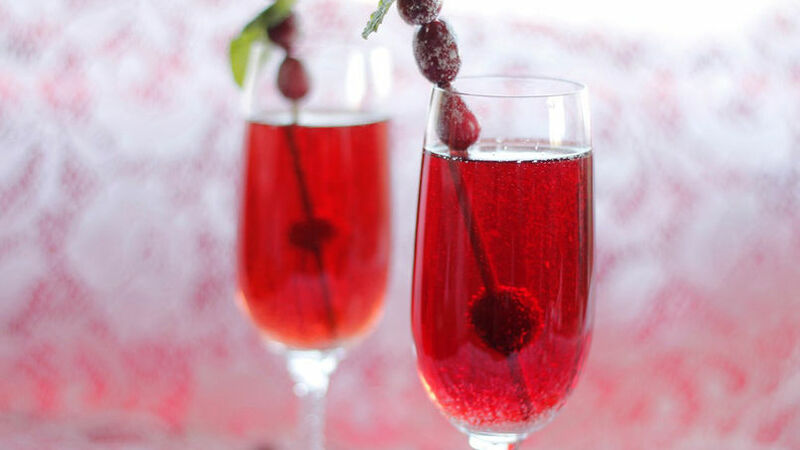 The sparkling wine makes it refreshing and the pomegranate juice gives it the perfect sweetness. Cheers!